WHO'S NEXT? Will crafty Nikita Khrushchev (Steve Buscemi, third from left) or frightened puppet Georgy Malenkov (Jeffery Tambor, second from right) ultimately seize power? Glen Filled with clever zingers and scathing political humor, there's a lot to snicker at here, but I didn't seem to find the film as laugh-out-loud funny as many did in the screening we saw. It's basically about the bumbling struggle created by the power vacuum following a murderous despot's death—small-minded, venal men stepping all over each other in their quest to gain control. Sounds hilarious, right? Right? Meanwhile, people on Stalin's purge "lists" suddenly get a reprieve, like the poor sap in a line of prisoners being summarily executed against a wall. Bang! Bang! Bang! "Oh, you're free to go now." Stalin's played as a capricious, paranoid madman, and the bootlicking sycophantic toadies surrounding him have to make sure they laugh at his jokes and in turn amuse him and stay in his favor. When Khrushchev returns home to his wife at the end of a long evening with Stalin, he dictates to her which targets of his jokes Stalin laughed at and which fell flat so as not to repeat his mistakes. Khrushchev and the others can see Stalin's actions are reprehensible, yet they're so in fear of losing their place in the inner circle that they go along with anything, which doesn't leave me with a protagonist worth rooting for. As a depiction of an ugly quest for power, it's spot on, and though I find it an imperfect analogy, one can certainly compare the depicted Stalin's administration with Trump. And it's absolutely an indictment of Russian governmental corruption, so yes, it's a savage satire but not necessarily a funny one. Anna The Death of Stalin is a satirical farce, certainly playing at and paralleling some of today's politics. There are funny moments, and the talented cast has fun with the circus of it. Buscemi is the frustrated and beleaguered Khrushchev who guises under working toward the greater good but ends up being just as corrupt and power hungry as the rest, maybe even more so. Beria (Beale) comes off at first as the obvious villain—the head of security who orders the deaths of those Stalin sees unfavorably, and he's the person who found Stalin after an aneurism and immediately began plotting his takeover. He squirrels away evidence against his fellow board members, playing his cards where he can to try and gain power. Soon death warrants are being revoked, prisoners are being released, and Malenkov (Tambor) is posing for his role as leader and chief. He's a wilting flower though, unable to decide anything and worried more about people's perception of him than actual leadership. The film has some gems of comedy throughout, but sometimes that humor is lost in a jumble of farce. Overall, it's funny but not a riot. CALL A DOCTOR? After Stalin (Adrian McLoughlin, lying down) falls gravely ill, each member of his power mad inner circle (left to right: Steve Buscemi, Jeffery Tambor, Dermot Crowley, and Simon Russell Beale) plots his next move. Glen The performances all around are solid, with Buscemi and Tambor standing out. Because of how some of the characters are written, a few performances border on cartoonish, such as Jason Isaacs as Field Marshal Zhukov and Stalin's kids, Svetlana (Andrea Risenborough) and Vasily (Rupert Friend), who are rather cliché. 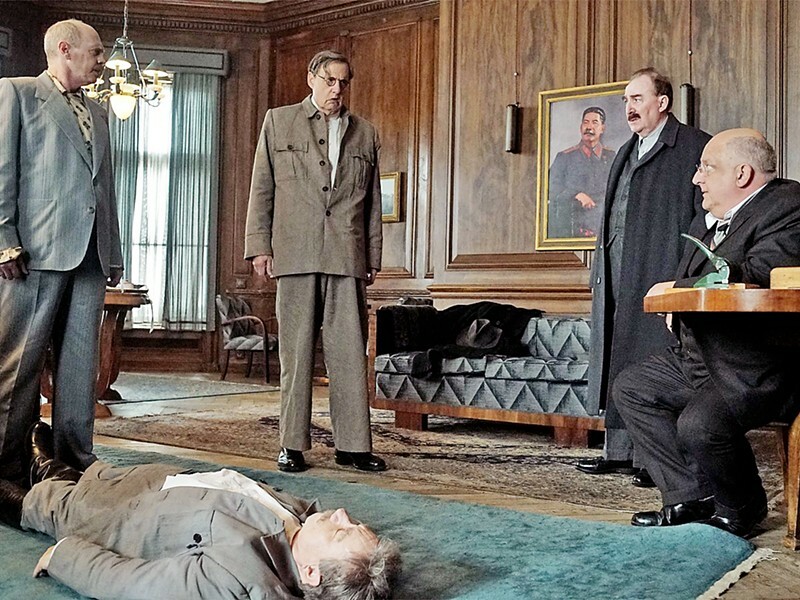 If you're a fan of Mel Brooks' (Blazing Saddles, Young Frankenstein, High Anxiety, History of the World: Part I) writing and directing, you're probably going to love The Death of Stalin and its broad characters, irreverence, and absurdity. On the other hand, a comedy about gulags, executions, and political backstabbing may not be your cup of tea. I can definitely see this film dividing audiences. For me, it works best as a depiction of toadyism and fear. An early scene shows a radio broadcast of a live performance of Mozart, and as it ends Stalin calls the broadcaster demanding a recording. Oops! They didn't record it, so they have to corral the musicians to perform it again, except the gifted pianist star Maria Veniaminovna Yudina (Olga Kurylenko) refuses ... until the frightened broadcaster agrees to pay her extortion money. Living at the whim of a violent dictator seems less than fun, so while I appreciated the film's biting satire, I also found its world more than a bit depressing. Maybe due to the current White House occupant, I've grown tired of politics.